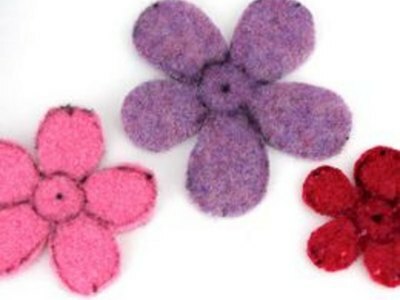 Create environmentally friendly flowers from recycled felted-wool sweaters and scraps. Flowers can be worn on their own as brooches, or used to make bold embellishments to hats, scarves, bags, or other accessories. 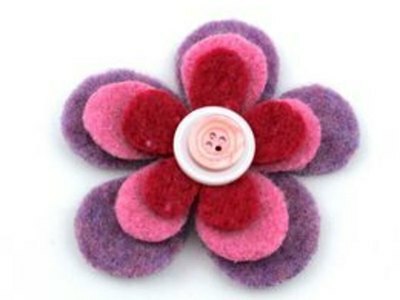 To create this flower you'll need felt scraps from wool sweaters, a ruler, marker, scissors, a needle, upholstery thread, two buttons, round household items to use as templates, and a pin back. 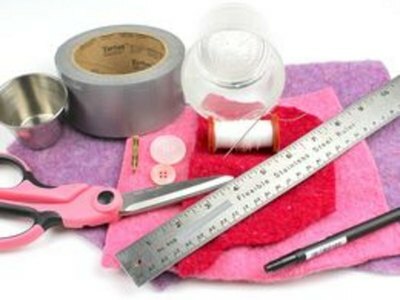 Please see the last slide for an itemized list of tools and materials. 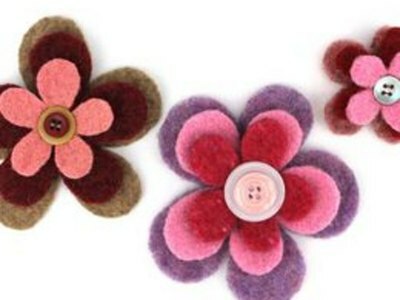 Choose enough felt to make three differently colored circles with diameters of 4 inches, 3 inches, and 2 inches. 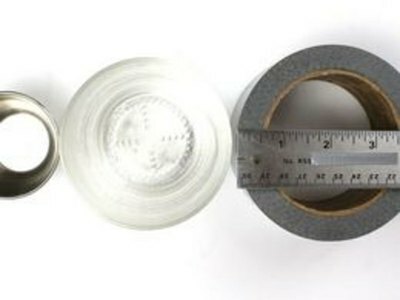 Choose three circular items that you have on hand to use as templates: One with a 4 inch diameter, one with a 3 inch diameter, and one with a 2 inch diameter. 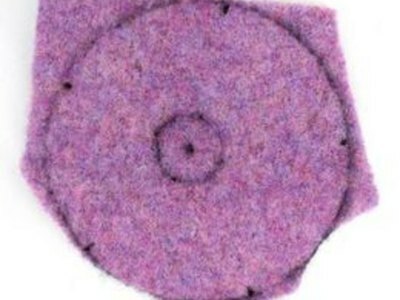 On the wrong side of the felted wool, draw a circle using the 4 inch diameter template. Mark the edge of the circle with 5 evenly spaced dots to use as guides. Mark the circle's center and draw a circle with a 1 inch diameter around the mark (you can use the 1-inch button as a guide). Using the dots as guides, draw a five-petaled flower inside the large circle. Make each petal start on the inner circle and end on a dot on the outer circle. Petals should join or overlap about 1/2 inch from the inner circle. The petals don't need to be exactly the same size, and the flower shape doesn't need to be perfectly symmetric. Cut out the flower shape, but don't cut all the way to the inner circle. Repeat steps 4 through 7 using the other two templates to make the 2 and 3 inch flower shapes. 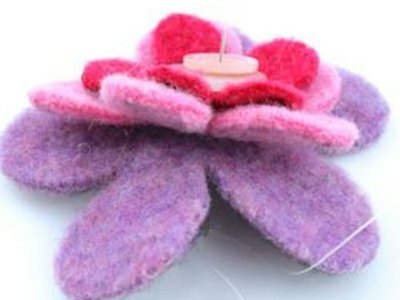 Turn the 3 flower shapes so that the right side of the felt is facing up. Perfect the shapes by clipping and trimming the edges -- avoid bulges or indentations and give each petal a smooth curve. Stack the flower shapes with the biggest flower on the bottom and the smallest flower shape on top, rotating the flower shapes until the petals are aligned. Center the buttons on the top flower shape with the smaller button on top. Starting from the back side, insert a needle with about 20 inches of doubled and knotted thread through all layers including buttons. Insert the needle back through and pull tight. 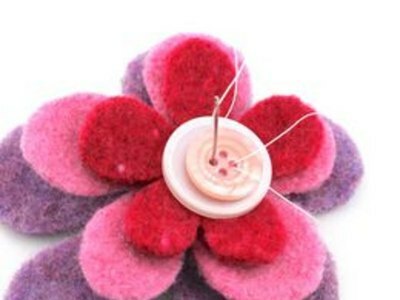 Secure the flower by knotting the thread on the back side without cutting the thread or removing the needle. Repeat steps 11 and 12. 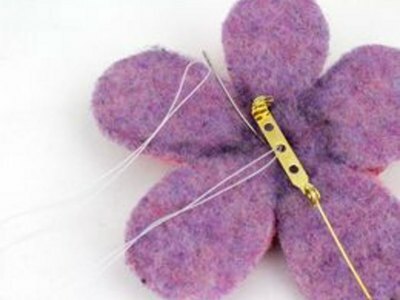 On the center back side of the flower, position the pin back and sew it securely to the flower, making sure the stitches don't show on the front. 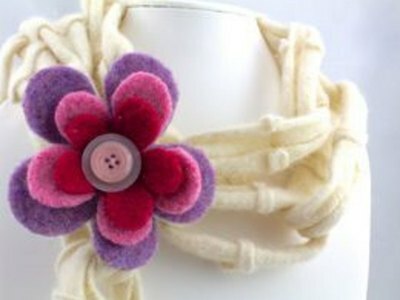 Pin the felt flower on a purse, scarf, hat, or belt to embellish your favorite accessories. Or pin it to clothing to add a flashy element to an outfit. Choose felt from 100 percent lambswool sweaters for best results. Vary the sizes of the circle templates to create different sized flowers. 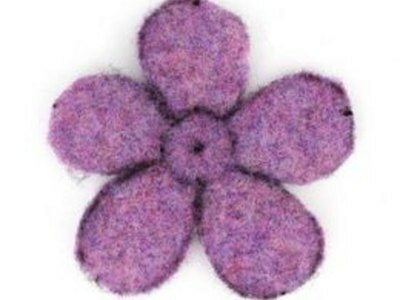 Flowers may be created with one felted sweater for a single colored flower, or with sweater scraps for a multiple colored flower. Check wool edges for fraying. If the fibers stay together when rubbed it's properly felted and won't fray. 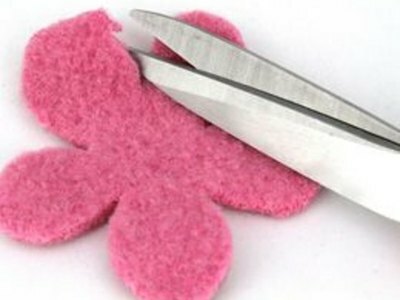 Extra-sharp scissors make cutting the flower shapes easier.